The Center for Excellence in Governance or CEG, a consortium of institutions committed to raising governance standards in the country through its four advocacies, namely, the Institute for Solidarity in Asia or ISA (public governance), the Institute of Corporate Directors or ICD (corporate governance), the Center for School Governance or CSG (school governance) and the Center for Family Advancement or CFA (family governance), expresses its great concern in the current efforts to compel Chief Justice Maria Lourdes A. Sereno to immediately resign – an act which would effectively deprive her of the legal process mandated by our Constitution for resolving complaints filed against her. Such a process serves to protect not only the rights of the Chief Justice but – more importantly – the legitimacy and effectiveness of our institutions of public governance. The Constitution is the fundamental law of the land, having been promulgated and ratified by the sovereign Filipino people. All three co-equal branches of the government are bound to respect and obey this Constitution. 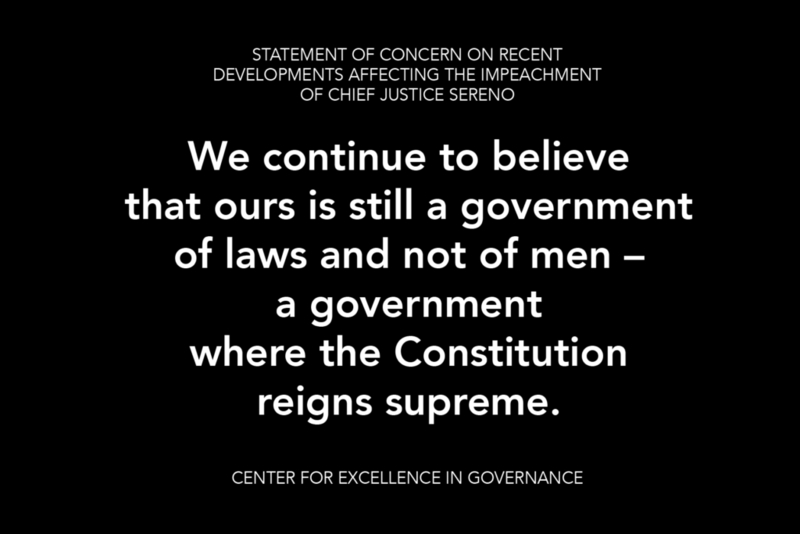 We urge our legislators in both houses of Congress – the members of the House of Representatives and, should the Chief Justice be impeached, the members of the Senate – to be circumspect in the exercise of their respective roles in the impeachment process. We enjoin them to utilize impeachment proceedings as an opportunity to strengthen, rather than weaken, our democratic institutions. We continue to believe that ours is still a government of laws and not of men – a government where the Constitution reigns supreme.